The standard bearer for “creative non-fiction,” John McPhee has a clean writing style that reads like you’re reading a magazine. The problem is, you are not reading a magazine–you’re reading a book. And therein lies my problem with McPhee. I have nothing against fix-up books, i.e., taking magazine articles and collecting them into volumes for book publication. It’s a long and established tradition, and preserves great magazine writing that would otherwise languish in microfiche drawers. But it seems that some writing makes the transition better than others. Take Stephen Jay Gould, for instance; although his essays originally saw print in Natural History, when you read the collection, they seem as fresh and lively–as timely–as the day they were written. McPhee seems dated, and the connections seem tenuous at times, with the endings sometimes falling flat. I read The Control of Nature over a year’s period. This was the most recent book given to me by Jill to read (we have alternated recommending books to each other, but gotten behind in recent months), and then, prior to going to Switzerland, we obtained La Place de la Concorde Suisse to study up on that country. By these, I assume that most of McPhee is well-researched, anecdotal non-fiction on a topic, wandering merrily from place to place with a theme in mind, if no actual structure. Maybe I’m being harsh, and I’ll freely admit that McPhee can get across some of the most mundane details, but I really had trouble with his article construction. I’m not expecting topic paragraph, explication, and conclusion, per se, but a road map and a legend would not be too much to ask in some cases. La Place de la Concorde Suisse, John McPhee, Noonday, 1984, ISBN 0-374-51932-3, $10,00, 150pp. La Place de la Concorde Suisse is about the Swiss army, but, as they say, when you talk about Switzerland, you talk about their defense. Because everyone in Switzerland is in the army, you are talking about their country. An incredibly rich country, and thus, an incredibly paranoid country. 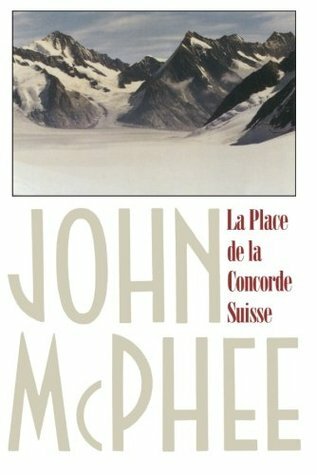 Although many people are now looking at the Swiss, and especially their banks, with new eyes following the revelations of Nazi war booty being hid within their anonymous, numbered accounts, McPhee put them in the spotlight a decade earlier here. While his light is not as bright as some of those today, he did discover some interesting bits which had been hid by shadows before, like their placement of explosives (or identification of where to place such) under each bridge into the country, a discussion of the surreptitious bombing they suffered under Allied planes in the war, and the old boys network that links the army and the industry. At the end, you don’t necessarily emerge with a message, but rather a portrait of the country. 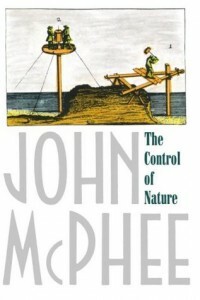 The Control of Nature, John McPhee, Farrar Straus Giroux, 1989, ISBN 0-374-12890-1, $17.95, 272pp. In contrast, message is the medium of The Control of Nature. In a series of three essays, each regarding a different geographical region, McPhee shows that in the war between man and nature it’s a case of the humans on horseback facing a blitzkrieg of geological heavy artillery. What amazes McPhee, and thus what comes across to the reader, is the arrogant hubris of the people who feel that nature can be controlled. One essay is about the Mississippi river, and how it has been channeled by dikes and levees to stay on the course that it has been set on since the early part of this century, although anyone can see that it is in its nature to change course. Essay two is about the lava flows in Iceland, where the engineers used the cooling power of the sea to divert the flow from a township–at least for now. And, last, McPhee covers the shifting mountainsides of southern California–not the mud of the beach homes, but the Santa Gabriel mountains which are so geologically new that the rocks that they consist of are more akin to sand. In each essay, the humans have fought the battle to a draw, but the enemy is worse than any evil fantasy. Nature is unsleeping, its forces are legion, and each battle it suffers no losses. The expense, in both money and lives, of trying to withhold the inevitable seems to doom the humans to lose. But they do not give up. It’s not that I do not like McPhee. On the contrary, I find his subjects fascinating, and his writing vivid. I just expected something more tight and focused.